Aix sponsa. 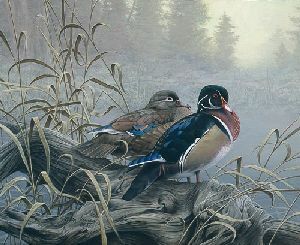 Nesting high up in a hollow of a tree, in a forest area that is sometimes a mile from water, the Wood Duck has been called many names: Woody, Wood Widgeon, Tree Duck and Acorn Duck. The striking plumage of the drake and the modest, but equally beautiful feathers on the hen, together make them an elegant couple. These wonderful ducks are at the end of a private, woodland pond, shrouded in morning mists. Print released 1987.